Verdi’s life-long love affair with Shakespeare’s works began with Macbeth, a play he considered to be ‘one of the greatest creations of man’. With his librettist Francesco Maria Piave Verdi set out to create ‘something out of the ordinary’. Their success is borne out in every bar of a score that sees Verdi at his most theatrical: it bristles with demonic energy. 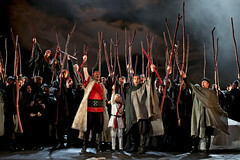 Your Reaction: What did you think of Verdi's Macbeth live in cinemas? Audience responses to The Royal Opera's live cinema relay of Verdi's Shakespearean opera. Verdi's tragedy will be broadcast live across the world as part of the Royal Opera House Cinema Season. To find out more visit the Macbeth (2018) production page.